Here is a collection of some of my favorite tips. These are wonderful tutorials and techniques by my fellow designers and crocheters, in one place, for easy reference. I hope you find them useful. 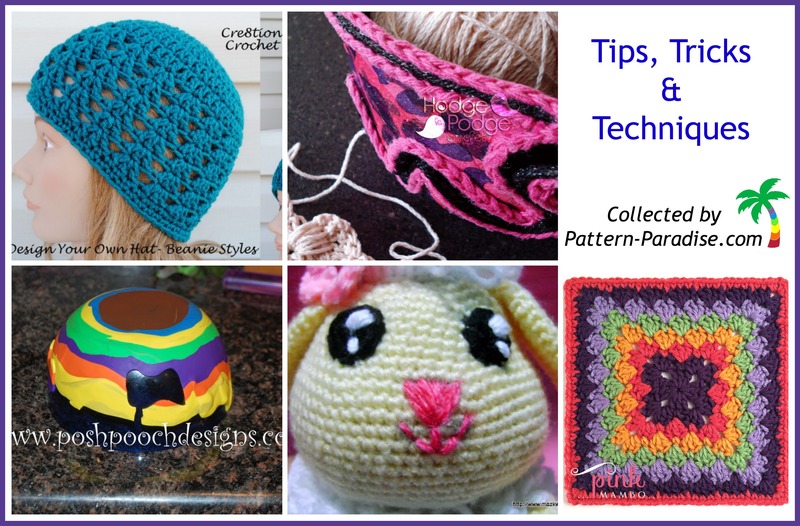 Cre8tion Crochet shares her technique for designing your own hat. Hodge Podge Crochet shares her technique for making paper macher yarn bowls. You know those adorable stuffed animals with expressive eyes? Ever wonder how to make them? Wonder no more, A Crafter X D shares a couple of different methods. Do you love colorful projects and wonder how to coordinate an eye catching color palette? Pink Mambo shares her method for experimenting with color in nature. Posh Pooch Designs shares her method for making clay yarn bowls. I just found your tips. Thanks so much, I am always looking for new things to share with my crochet/crafty group. I started out as their crochet and knit teacher and l have learned quilting, jewelry making and so much more from my former students. That’s excellent! Check back often as I add new ones from time to time! First time I’ve ever heard of clay yarn bowls or paper macher bowls. Cool!